At Simple Truth Chiropractic, we believe in whole body wellness through structural correction. We offer some of the best massage therapy services in Grand Rapids. We help people achieve this through teaching them about the three T's of disease. These three T's are traumas, toxins and thoughts. We integrate massage therapy into our overall wellness services to help relieve stress, remove toxins and reduce trauma to certain areas. Have you been looking for an incredible massage therapist in the Grand Rapids are? Then meet Jewly Warren and Charde Perry. With years of experience treating thousands of clients, Jewly and Charde's expertise in knowing exactly what you need is second to none. They provides the perfect amount of pressure based on your preferences and will prescribe specific stretches to help you with the specific issue that you're dealing with. 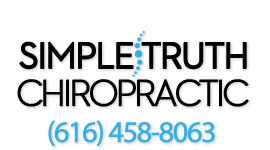 They works hand in hand with the chiropractors at Simple Truth Chiropractic to assist you in the healing process. We have massage packages available for 60 minute and 120 minute massages. The massage hours do book up fairly quickly at the beginning of the week, so we recommend scheduling at least 1 to 2 weeks ahead of time before your appointment. This will ensure that you get the appointment time that you desire. We look forward to seeing you in the office. Call today to book your relaxing massage.